Baxter Building Ep. 24: "But What Can I Do? What Can Anyone Do?" - Wait, What? Previously on Baxter Building: The Fantastic Four almost died on a mission out in space, but because these are monthly superhero comics, they instead ended up younger than they were when the series started — except for Johnny, which will never be mentioned again — and also more powerful, because comics. Editorial Note: If you’re reading this on Monday night, two things: Firstly, there are no images, and secondly, this should’ve been up hours ago. Both are related to how busy today has been, and I apologize profusely. There’ll be images in this tomorrow, honest! (As long as tomorrow isn’t as crazy as today!) Tuesday update: Images are in! But they’re from the GIT Corp. DVD scans, hence the Marvel watermark on a couple of them. 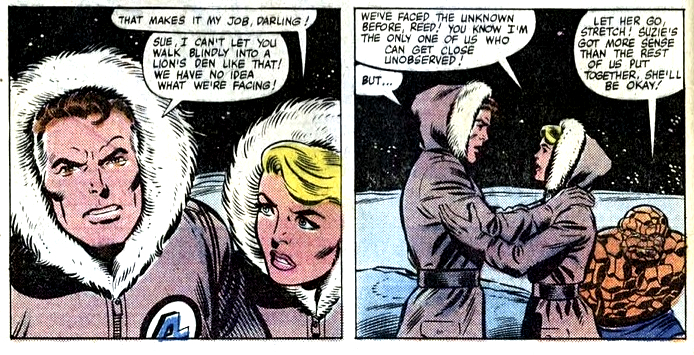 Look at the Joe Sinnott redraw on that Sue in the first panel! 0:25:07-0:30:48: In a surprise move, the one issue that deals with the end of HERBIE proves to be the best issue of this episode, as FF #217 sees an unexpected “This Man, This Monster” riff and the “Why didn’t anyone do more with this?” pairing of Johnny Storm and Dazzler. Genuinely, this issue is so much fun, it almost makes up for the fact that I kept saying “HERBIE goes bad” and not “HERBIE goes bananas.” What was I thinking? 0:37:12-0:45:37: A sign of what’s to come shows up in FF #219, which sees Moench and Sienkiewicz offer a fill-in that has some staggeringly bad pacing and overly busy pages, while offering arguably the most boring Sub-Mariner story this series has seen yet. Which, let’s be honest, is really saying something. “There is no need to read this comic,” Jeff says, and he’s not entirely wrong, sadly. 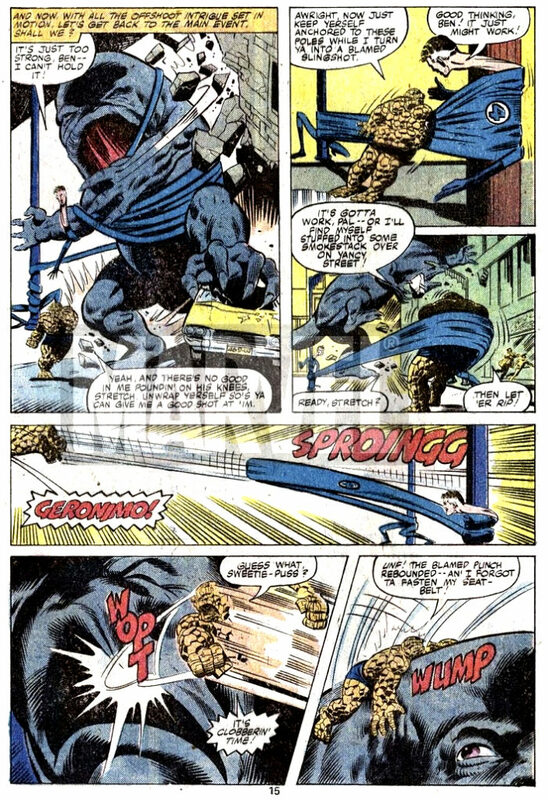 0:45:37-0:53:06: John Byrne’s first writing credit on the series — in Fantastic Four #220-221, which he also draws — feels like an annual split between two issues, but it’s a nice little two-parter that shows that he understands the basic appeal of the series. “There’s a lot to like in here,” as Jeff puts it, not least of which is seeing Byrne flip what has become a FF cliche around to make it seem oddly new and charming. Is this a sign of things to come? 0:53:07-1:13:38: FF #222-223 sees Doug Moench and Bill Sienkiewicz take over as the regular creative team of the book, and we’re thrilled about this, if “thrilled” means “struggle (and succeed!) in finding upsides.” Meet creepy Franklin Richards, and then magical, creepier Franklin Richards, as Nicholas Scratch returns, Agatha Harkness says goodbye and Salem’s Seven make everything slightly better. We talk about the influence of fandom and how much it plays into this run, Bill Sienkiewicz seemingly playing against visual type wherever possible — not in a good way — and Jeff explains the purpose of a character making a cameo in this storyline far more thoroughly than the story itself does. Oh, and we come up with the best Chris Claremont Fantastic Four annual that never happened. 1:13:37-1:24:14: Jeff tries his hardest to defend the Garth Marenghi-like tendencies of Doug Moench in Fantastic Four #224-225, two issues that feel like the most Marenghi FF yet. There’s a lot of apocalypse going on, but also a lot of pretension, a surreally out-of-nowhere Thor and Odin cameo, the most lackadaisical Fantastic Four ever, and a threat that manages to undersell itself and the fact that he’s basically Benevolent(ish) Vandal Savage, and yet none of it comes across as being particularly interesting. 1:24:15-1:31:57: FF #226 is described by Jeff as “the best,” but I can only assume that he’s being sarcastic. Moench decides that it’s time to wrap-up loose ends from Shogun Warriors, but he’s hobbled by two factors. Firstly, Marvel clearly doesn’t have the rights to the characters anymore, so you won’t be seeing those giant robots this time around. Secondly, Bill Sienkiewicz is not interested in playing to the cues Moench is giving him. “It’s rank,” Jeff goes on to describe it as, and… well, he’s not wrong. Looking for some upside, we end up talking about the number of times Moench and Sienkiewicz talk about Moon Knight in these FF issues (It’s a lot) and guess about potential reasons why. 1:31:58-1:35:24: Fantastic Four #227 is “everything you could hope a story called ‘The Brain Parasites’ could be, except good,” as I describe it, and I stand by it. On the plus side, even as the story gets ridiculous (Prehistoric monsters devolve people, including Sue, into monsters! ), the art gets a nice bump when Bruce Patterson shows up and brings out an entirely different side to Bill Sienkiewicz than we’ve seen in these pages so far. 1:35:25-1:41:44: Joe Sinnott returns to do full finishes in FF #228, so the book looks better despite some by-now-unsurprising bad layouts from Sienkiewicz, but that’s not the only problem with the issue. “I can’t even wrap my brain around what’s happening,” Jeff says, and perhaps that’s because we get an issue where Johnny is impressively callous, while Franklin’s childhood trauma is given purple-leotarded form. No, really; that’s not an exaggeration. We’re firmly in the era of some impressively bad comics right now. 1:56:22-end: …A discussion about the strangeness of the Moench/Sienkiewicz run as a whole, and the ways in which it almost cleared the creative palate before John Byrne comes on board. If nothing else, this is a run that feels like something other than an attempt to recreate the Lee/Kirby thrills on an ever-decreasing scale of success, and even though it was more of a creative failure than a success, something should be said about that. Admittedly, what it seems to say to both Jeff and I is that we’re really ready for Byrne to take over the series with the next issue — and the next episode of this here podcast, which will cover #232-237 of the series. That’s how we’re going to be starting 2017, so you should join us for that. In the meantime, you can find us on Twitter, Tumblr and Patreon, and also accept my apologies for this post being quite as late as it is — today has been ridiculous behind the scenes at Wait, What Towers (Portland Outpost). Normal service will be resumed soon…! Long-time lurker (from the very beginning, can you believe it? ), first-time commenter. I’m following along with (some of) these issues via the “Fantastic Four by John Byrne Omnibus” (yes, I buy comics by the pound). 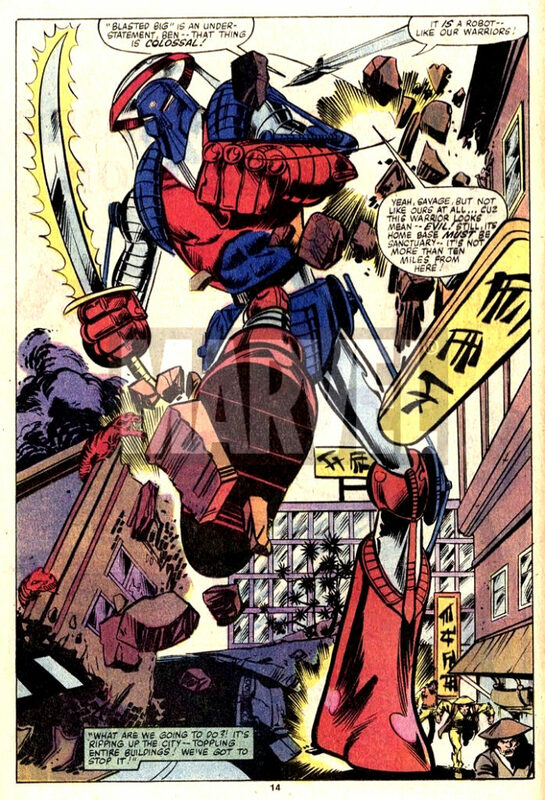 According to that weighty tome, the 220-221 issues were a story “originally intended as a promotional comic”. So that explains much of what you guys noticed: the story is a bit generic and certainly stand-alone, the characters each demonstrate their powers at the beginning, they act in a very canonical fashion, and there’s even a recap of the origin. As for the Moench/Sinkiewicz team, I recently re-read their Moon Knight for the first time since its publication. I’m now convinced that people remember it fondly because they haven’t read it in ages. It has exactly the same problems you pointed out on this run: terrible pacing, plots that are an over-stuffed mess, Sienkewicz (I’ll just spell it differently every time – it’ll probably be right once), while showing occasional flashes of something interesting, is overall just inexperienced and not yet competent. It’s really pretty lousy. Much like the original Battlestar Galactica series, it’s a frustrating failure because it had everything going for it: a cool design, an interesting premise, intriguing visuals… but the stories were just crap. Anyway, back to FF – things certainly get tons better with Byrne. Even when his stories are a bit dull, he’s always competent with pacing, plotting, and prose quality, and of course there are at least a few visually arresting images in every issue. Say what you will about the man, and it’s too bad he’s now known mostly for being a curmudgeon, but his FF run contains some pretty brilliant stuff. This is very early Sienkiewicz art and like a lot of Adams influenced artists I don’t think he understood how much Adams used photo reference to achieve his effects and instead just tried to internalise Adams style by looking at his comics. Of course, Sienkiewicz does then rapidly develop his own style and storytelling, but even the Moon Knight comics of this period aren’t the really good looking ones people remember. The way some artists develop in comics is one of the most exciting things for me as a reader. 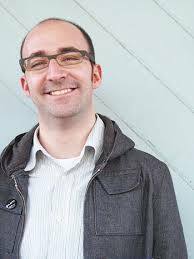 I think of the both of you as leaning more to the writing than I do and wonder if you see that kind of progress in writers? With artists there are points in their development where they almost look better issue to issue, have there been writers where you’ve felt something similar? Byrne’s two-parter was actually done as a Coke promo that fell through, the story at the time being that Coke found the comics too violent. There were also Hulk and Spider-man stories that were printed in annuals. I actually read and kept this run, which is where I started to read the book and one of the few post-Kirby runs I still have of the original series (this and about half of Simonson’s run, other than that just scattered issues). Haven’t touched it in about 25 years, so who knows if it holds up. Note that Sienkiewicz was doing this concurrently with his Moon Knight run. He actually did some MK stuff for the magazines first, then started this as his first regular comics assignment, then did both for 8 months. It’s right when he leaves FF that he begins to ink his own work for the most part, and really starts his evolution from 3rd rate Neal Adams to 1st rate Sienkiewicz. Ah, Shogun Warriors. You were never very good, were you? I did collect that series, and was happy at the time to have something approaching a wrap-up appear in another book I was already getting. I can’t recall what the appeal was. Maybe I just thought that giant robots should work, and I’d stick with the book until the creators figured out how to make it work? I got a couple of random Red Ronin appearances too. 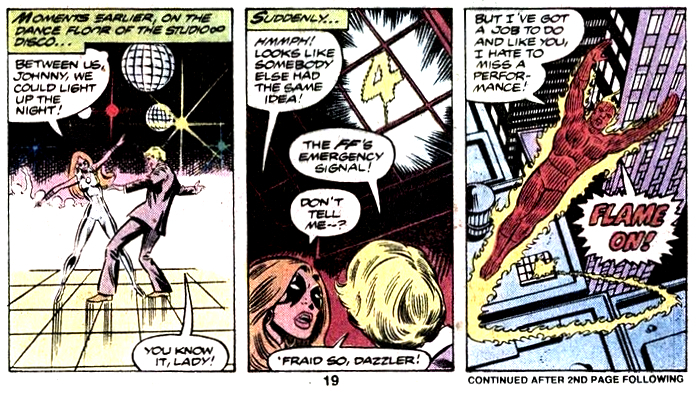 Johnny made a few appearances in Dazzler, but the book’s super hero love interest of choice was Angel so he didn’t get much panel time. As BobH notes, Sienkiewicz changes tremendously over the course of drawing Moon Knight and I have no particular compunction about recommending all of it; the Midnight Man two-parter, both Stained Glass Scarlet stories, the extra-large Black Spectre story in #25 and the well-regarded “Hit it” are all highlights. Then again, I have a lot of time for Moench – Master of Kung Fu is another all-time favourite series of mine (not so much his FF).